The Epiphany is a particularly special day for us Christians, because it is a fulfillment of God’s promise and revelation that He comes… for everyone! Today’s readings and psalms focus on God making a covenant, not only for the Jewish people, but for all people of good will. And that includes us Gentiles! After all, the foreign magi are the ones who are one of the first ones to seek out and submit themselves to the kingship of God — even though Jesus is only a tiny baby at the time. And thus, it is called the epiphany! After all, an epiphany is when the divine manifests and reveals itself to us. And what greater divine revelation can there be than when Christ reveals Himself to us? 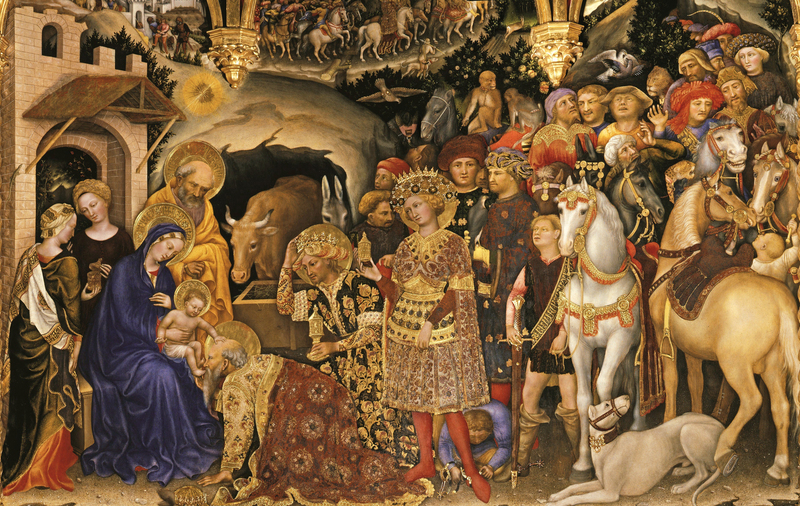 Adoration of the Magi (detail), by Gentile da Fabriano, c. 1423. Uffizi Gallery Museum, Florence, Italy. 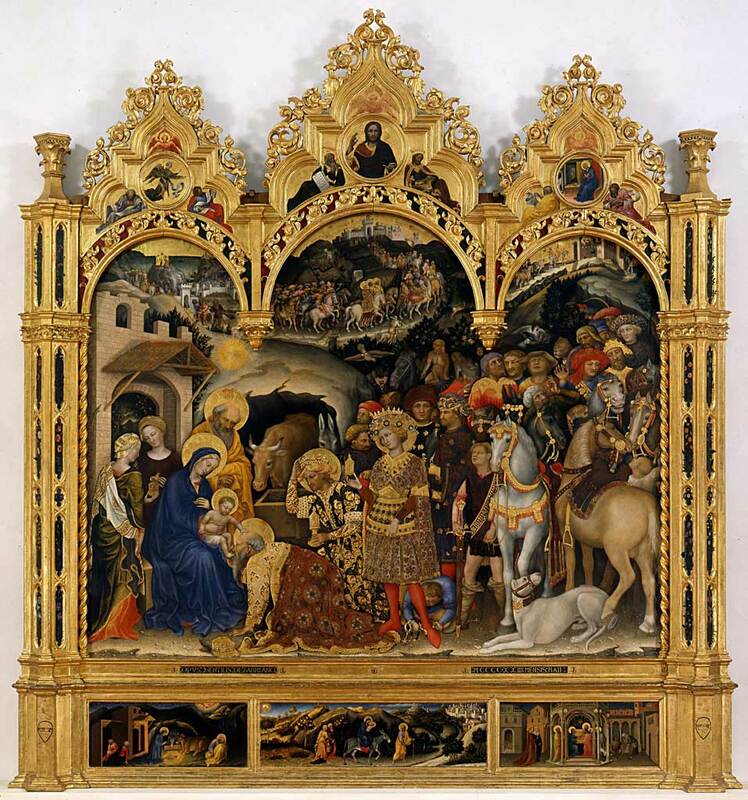 Adoration of the Magi, by Gentile da Fabriano, c. 1423. Uffizi Gallery Museum, Florence, Italy. If you want to look at it in much greater detail, go here. On the top left, you see the Magi up on top of mountain, looking up at the brilliant sky with their servants stocking up for the long trip. Then, in the middle top, you see the grand entrance of the Magi’s servants and magi coming into Jerusalem. Finally, on the right top, you see the Magi themselves entering into Herod’s palace! How much that contrasts with the true king’s panels on the bottom! At the very bottom, the tiny panels depict a quiet nativity scene, a long trip into Jerusalem in which St. Joseph leads the way, and the encounter between Simeon and the Holy Family in what we typically call the Presentation! And yet, though Jesus is born of humble origins, it is the kings that kneel to Him! What details draw you in deeper into this art? Contrast the humbleness of the Holy Family with the Magi’s wealth. And yet, they meet up with each other, with the Magi honoring Christ! In what ways has the humble things you encounter greatly exceeded your own material possessions? The magi, in all their richness, gave their treasure to Christ. What treasure do you bring to Christ? Thank You for coming to us and giving us that chance to experience Your divine revelation! Help us bring our treasure to You, always. This artwork is featured in my book, The Joyful Mysteries! Learn more about it here.